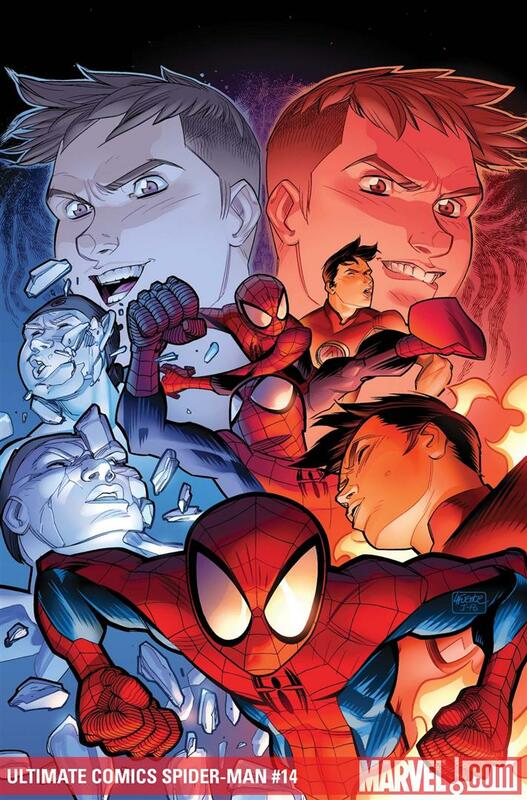 The double-life of Peter Parker comes to an end in this issue, but does Brian Michael Bendis change the status quo of the USM universe, or is everything back to normal…again? Previously in Ultimate Comics Spider-Man: Following Magneto’s crazed attack on the world, everyone realizes nothing will ever be the same…again. Peter Parker is living with his aunt, his girlfriend Gwen Stacy, and his pals Johnny Storm, and Bobby Drake, and life seems to be getting better. Peter even tries to make amends with his boss J. Jonah Jameson, until he realizes his boss is really an impostor – a shape-shifter with a smelly cigar. The villain overpowers Peter, and steals his identity as Spider-Man. Farker (Fake Parker) uses his powers and new identity to go on a city wide crime spree, while real Parker and J.J. Jameson are tortured by Farker’s twin sister (who is also a shape-shifter). Things go from bad to worse when Farkette points a gun at J.J.’s head and pulls the trigger. At some point we need to have a discussion over why so many people with super-powers go wacky-in-the-wicky-woo, and attempt to tear down everything that has been built around them. While it might seem like a good idea to impersonate Peter Parker and Spider-Man to gain all the honors and benefits that go with it, Farker and his sister have turned the switch to Pure Evil. With J. Jonah bleeding out on the floor, Peter is tortured with the notion that everyone he knows and loves is going to be killed unless he coughs up superhero secrets that can be sold on the black market for mega-millions. Farker decides it’s better to knock over banks and try to walk off with millions with nary a care in the world. Of course his view on the world is compounded by his addiction to mutant enhancing drugs, which he uses to against the Human Torch and Iceman when they figure out the Parker they know isn’t the Parker they love. As you might expect in the concluding chapter of an arc, Peter is rescued, and while things may never be the same again, the general feel for life in the world of USM appears to be back to normal. Every so often writers get to the point where they need to address the question of “why not just kill the villain(s) so they never trouble us again?” It’s a question that has been discussed in every comic book shop from here to San Clemente, and it usually ends with the hero not crossing that line because he is better than those he fights. It’s a noble decision, and one that Bendis broaches when the villains have been nabbed and the greater implications of their wrongdoings begin to come to light. Was the decision to turn the duo over to S.H.I.E.L.D. the right one? Sure. Was it the best one? If one is concerned with keeping the status quo, then the answer is yes. If one is concerned about dealing with a potentially huge character changing moment in a universe that is supposed to be, but not supposed to be, a rebooted Marvel-verse, I’m disappointed in Bendis’ ultimate direction. At the end of the day, I think I would side with the group that says, “Peter Parker Does NOT Kill!”, but I think Bendis blew an opportunity to generate a ton of buzz and get people talking about Ultimate comics again if he had removed the S.H.I.E.L.D. segment and slightly changed the exchange between Bobby and Peter to create that open ended What Did They Do? resolution. Can you imagine the ruckus a story element omission like that would cause if for months people were talking about what really happened in between the panels and pages? The reader teasing story implications are staggering. Even though I’m not particularly found of the overall ending of the story, the nature of the events that occur borders on the disturbing – it’s just not something that we typically see in Ultimate Spider-Man. Enhancing Bendis’ words is David Lafuente’s art. There is something delightfully twisted in the imagery conjured up by Lafuente. Whether it is Farker blasting the heroes with a pair of machine guns, seeing Peter Parker’s face on the bustiere enhanced body of Farkette, or simply seeing panel after panel of J. Jonah Jameson bleeding out on the floor, one comes out of the issue slightly unnerved over the intensity of the imagery. Justin Ponsor also deserves big kudos in this issue for his color work. With fire and ice occupying the same space, Ponsor creates highlights and pings in all the right places to make the environment look arctic cold or fiery hot without the two elemental opposites destroying each other. Plus I do enjoy seeing oranges and blues playing nicely with one another on the page, but that is just the way my brain works. I haven’t read Ultimate Spider-Man since about issue 9, but Bendis’ writing style, my familiarity with the situation following Ultimatum, and Marvel’s Previously In… issue lead-in made it easy to jump right back in to the story. And though I don’t know what kind of havoc Farker caused with Mary Jane and Gwen Stacy, and even though I didn’t see J.J. take a bullet to the head, I still enjoyed this issue a great deal. Bendis didn’t waste the space with overly wordy dialogue balloons, and I’ve actually grown to appreciate Lafuente’s art (especially in the few panels where it looks like he is channeling Gabriel Rodriguez). There’s plenty of action to keep the rock’em-sock’em crowd in check, and big picture philosophical implications for the brainiacs. 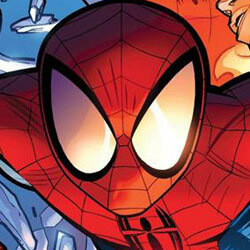 Ultimate Comics Spider-Man #14 is worth checking out, and deserves 3.5 out of 5 Stars. I’m not a TPB kind of guy, I’m more of a single issue man, but I might have to do something soon cause I have like issue 2 or 3 of Ultimate Spider-man I think, of the first volume and I haven’t read anything since, so I’ve kinda just been sitting with my blinders on kinda hoping it’d go away for a nice long time so I can catch up on what the hell has been going on over there. I think I initially thought it was just going to be some kind of mini-series and it just kept going and going and the further it went the more behind I was and I just decided to forget it. I’m sure it’s fantastic like Max but I will just have to slowly accumulate either back issues or *gulp* buy the trades.